The principles of “Soil-ecological zoning of Irkutsk oblast” [Kuzmin, 2004], “Soil zoning of the Baikal region” [Kuzmin, 1993], and “Soil-geographical zoning of Mongolia” [Dorzhgotov, 2010], the map of the soil cover, information on soils, their connections with the natural conditions, obtained as a result of the in-house long-term research, and materials on geology, topography, and other natural components were used when developing the zoning. In the map of the soil-ecological zoning, nine provinces are singled out, reflecting the peculiarity of the surface topography, since the ratio of the heat and moisture balance, which serves as the basis for zoning, manifests itself against the background of the complex orography. Here bioclimatic factors play a key role. Twenty-eight districts are distinguished in the provinces according to the lithologic-geomorphological features. From the standpoint of the structural approach, the districts are regarded as territories with a specific regular change of several types of the soil cover structure, associated with the features of terrain and parent rocks. The complex of all natural conditions that influence the formation of the soil cover is taken into consideration in the soil-ecological zoning. Connections of soils with other components of the landscape are identified. It is necessary to consider regional features of the soil cover when planning the distribution of agricultural production, while knowledge of the interrelations of soils with the natural conditions is essential to develop the measures aimed at avoidance of negative consequences of the anthropogenic impact. The maps of soil cover can be used as independent scientific works, characterizing the soil cover of the area, which is an important component of the landscape, as a starting material for the soil (land) resources accounting, as a support material for planning the chemicalization of the agricultural production, agroforestal and erosion control measures, development of forest resources, environmental protection, as a basis for various types of zoning, and as a manual for students of higher education institutions. Dorjgotov, D. and Batkhishig, O. (2009). Soils. Soil-geographical zoning of Mongolia, in National Atlas of Mongolia, Ulaanbaatar, pp. 120-122. Dorjgotov, D. (1976). Soil classification of Mongolia.Ulaanbaatar, 170 p.
Dorjgotov, D. (2003). 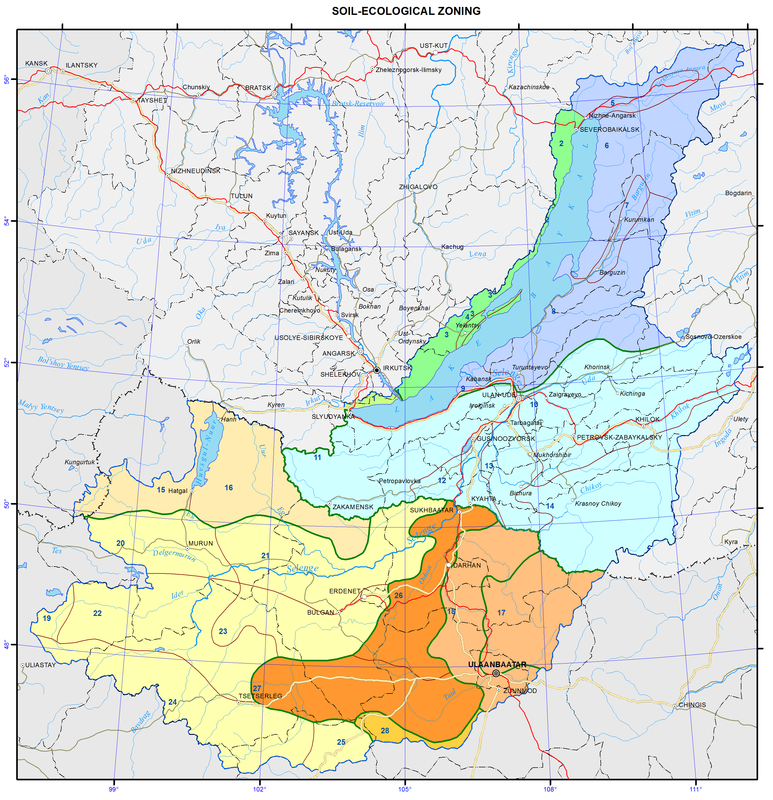 Soils of Mongolia.Ulaanbaatar, 370 p.
Classification and Diagnostics of Soils of Russia. (2013). Authors and compilers: Shishov, L.L., Tonkonogov, V.D., Lebedeva, I.I., and Gerasimova, M.I. Moscow: V.V. Dokuchaev Soil Science Institute RAAS, http://soils.narod.ru/obekt/obekt.html. Kuzmin, V.A. (2004). The soil cover. Soil-ecological zoning of Irkutsk oblast, in Atlas of Irkutsk Oblast, pp. 40-41. Kuzmin, V.A. ( 1993). Soil zoning, in Atlas of Baikal, p. 130. Ubugunov, L.L., Ubugunova, V.I., Badmaev, N.B., Gyninova, A.B., Ubugunov, V.L., and Balsanova, L.D. (2012). Soils of Buryatia: diversity, taxonomy and classification, in Bulletin of the V.R. Filippov Buryat State Academy of Agriculture, no. 2, pp. 45-52. Shishov, L.L., Tonkonogov, V.D., Lebedeva, I.I., and Gerasimova, M.I. (2004). 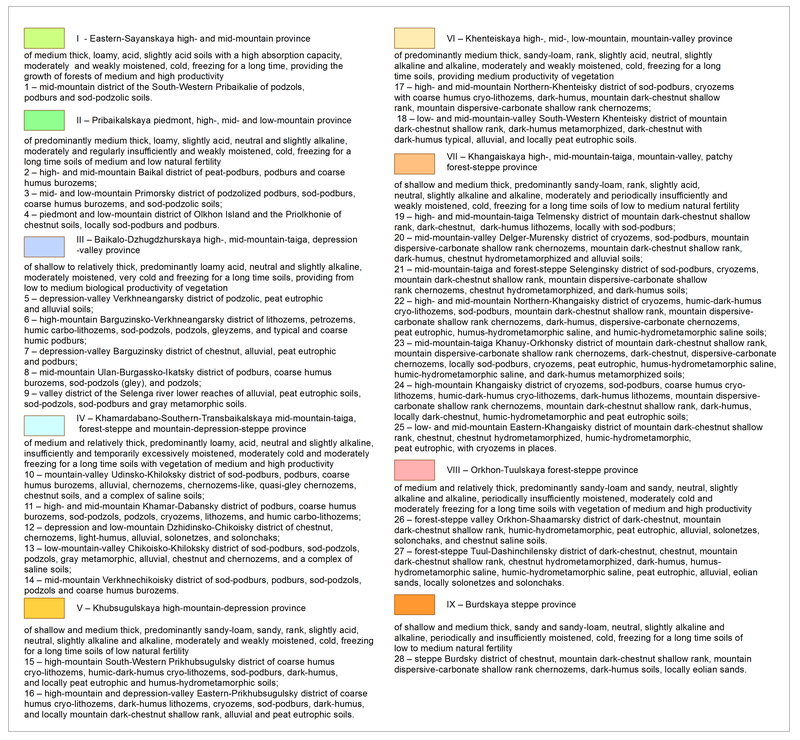 Classification and diagnostics of soils of Russia. Smolensk: Izd-vo Oikumena, 342 p.